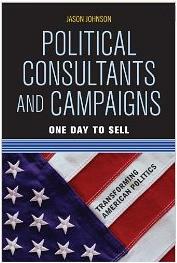 Professor Jason Johnson’s latest book is Political Consultants and Campaigns: One Day to Sell. The forthcoming book is being published by Westview Press and Perseus Books. One Day to Sell is an extension of Dr. Johnson’s research on campaign strategy and political communication. In particular, Professor Johnson examines the differences between how political science theory suggests campaigns should be run and how political consultants actually run campaigns in 21st-century America. In the wake of consultants who effortlessly move from campaigners to policymakers, the dearth of knowledge about the attitudes, beliefs and strategies of the consultants themselves is still a glaring absence in the analysis of American politics. How can we purport to know what is happening in American political campaigns if we don’t know what is on the minds of the men and women who run them? Political Consultants and Campaigns: One Day to Sell looks at consultant behavior on message formation, policy positioning, candidate recruitment and negative advertising. Do political consultants create campaign messages based on campaign context, the candidate’s traits, or both? Do consultants see a connection between how candidates campaign and how they actually govern? Professor Johnson’s research includes hundreds of interviews with campaign managers to reveal the electoral strategy in American politics. For almost 20 years, political science theory has been driven by two divergent views on policy positioning. Some argue that successful candidates must seek the median voter, others argue that they should position themselves in the direction of the most passionate voters. Until One Day to Sell, no one has included the views of political consultants on the question of candidate positioning. This groundbreaking research makes One Day to Sell a must-have for those seeking a full understanding of how U.S. elections work.